Arayot Campers Have Arrived at Yavneh! Whether you are a parent, loved-one, friend, sibling, aunt, uncle or some other interested party you’ll be pleased to hear that we’ve had an incredible twenty-four hours in aydah Arayot. Early yesterday, the madrichim (counselors) waited impatiently in their tzrifim (bunks) for the chanichim (campers) to arrive as another beautiful New Hampshire day began. But this wasn’t just any day in Northwood, this was the first day of the session at our favorite place in the world, Machaneh Yavneh. As chanichim started to show up at the tzrifim and unpack their things, a sense of excitement and anticipation could be felt from each and every bunk bed where parents, madrichim and chanichim could be seen arranging shoes under the bed and smoothing down fresh sheets on mattresses. 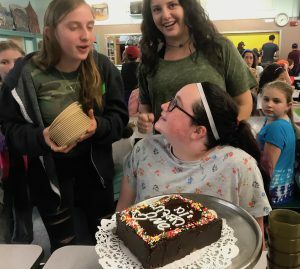 Once the parents got back in their cars with many teary eyes and backward glances, the madrichim and the chanichim dove right into playing icebreaker games and getting to know one another. We played all the way until it was time to go down to the toren (flagpole) for mifkad (camp-wide gathering). 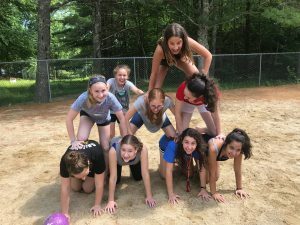 It was very exciting because it was the first time that everyone at camp was together and for many of us it was our first time seeing old friends from other tzrifim across camp. After mifkad we walked by aydah into the chadar ochel (dining hall) while chanichim from aydat Kerem (C.I.T.’s going into 11th grade) cheered us on. We ate a delicious lunch of pizza, salad and pasta and headed back to our bunks for a little menucha (rest time). Having been refreshed and rejuvenated by the sha’at menucha, the banot (girls) headed down to kolbo to have an ice cream party in celebration of our dear Carolyn’s birthday. We sang her happy birthday and sat on the porch eating ice creaming and talking. The rest of the afternoon was spent playing sports, getting to know one another, and swimming in the agam. We took our swim tests and now we are all ready to get right into swim classes and schiyah chofshit (free swim) in the afternoon. At dinner we ate schnitzel, mashed potatoes and mixed vegetables. Afterward the whole camp got up for Israeli singing and dancing with our music director Bentzi. It was so so fun! After dinner we played more games all having to do with a jungle theme. We played Hungry Hippo and Jungle Speed, among others. After a long day, we all agreed that a good night’s sleep is what we needed to be ready for another fun day at Yavneh. We headed back to the tzrifim, had our bunk meeting and then hopped right into bed so we could do it all again. Don’t forget to tune it this Monday for another riveting blog post from your favorite Arayot Roshes.